The Mountain Land Physical Therapy Boise Maple Grove Clinic provides comprehensive physical therapy and rehabilitation services for Boise, Idaho and the surrounding area. Located inside Crunch Fitness, the Maple Grove clinic delivers only the highest quality of care to every patient, every day. What an awesome staff! I have been telling my friends to go to MLR if they need any PT. My back is feeling much better. Just wish I would came to you sooner. All the professionals I met at Mountain Land were “people” people. They made me feel that they were happy to see me and cared about helping me progress to being pain free and healthy. They treated me with respect were were always professional in their actions and words. I actually looked forward to my sessions there and will miss not seeing them. Best of all, I’m now able to go forward with my life and engage in most of the activities that make my life enjoyable and rewarding. I have no doubt that I would not be at this level of mobility and strength without the knowledge of treatments I received from Kyle. The staff were amazingly friendly. … The therapists were understanding and committed to helping me get better. Kyle was the best and most encouraging therapist I have ever worked with, he was always giving me different exercises to help my knee. Everyone was friendly and caring. Should I ever need a physical therapist in the future, I would return to Kyle and Mountain Land in a heart beat! Kyle was GREAT! He worked with my 14 year old son and got to know him. … I can’t say enough good things. I would most definitely recommend Mountain Land. Dr. Herauf was born in the town of Dickinson, ND as the oldest son and middle child in his family of 5. He has been very active his whole life and played sports all through high school. Playing sports throughout his life helped to teach him the values of hard work and characteristics of leadership. So, when the time came for college he knew that he wanted a job that required quick thinking and would allow him to help people. It was then he decided to attend the University of North Dakota where he attained his Doctorate of Physical Therapy in 2013. 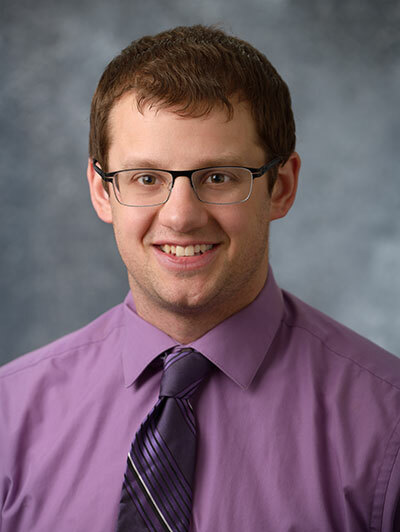 Kyle has a diverse range of interests in physical therapy and firmly believes that the more a clinician exposes themselves to new ideas the better they become. It is for this reason that you will always find him reading journal articles, attending courses and committing himself to lifelong learning. Kyle’s commitment and lifelong learning earned him his Board Certification Specialty in Orthopedic Physical Therapy in 2017. He particularly enjoys working on his manual therapy skills, exercise development and building a rapport with every person that walks through the door. Above all else his primary interest is helping his patients to achieve their goals and you can bet that he will do everything he can to ensure that you get where you want to go. Outside of the clinic you will find Kyle enjoying time with his wife Emily and his two dogs, Kevin and Edith. He enjoys spending time outdoors doing things like hiking and floating down the Boise River. He enjoys reading, particularly a good mystery novel. Above all else Kyle enjoys having fun with his friends and family with activities ranging from sitting at home lounging on the couch to exploring the country. 1435 South Maple Grove Rd.